Holes. Of all kinds and sizes. 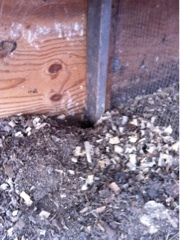 Holes mean that some critter has breeched whatever protection we have installed. This one, located next to the chick brooder, called for much more work to be done today than originally planned. We don't know what exactly it is. Sandi was on high alert all afternoon. A Jack Russell, her job on the farm is tracking down rodents, and she was tracking for hours. But no luck finding any. So the brooder was reinforced before the chick delivery went in today. Day old chicks, resembling cotton balls, are an easy target for any rodent, and we have seen pens emptied in just one night. Spring on the farm means the arrival of predators. They are having babies and need food for them. We want to encourage them to search...elsewhere.